Delta Air Lines 12th Annual Golf Tournament Helps Kids Like Larenz – Delta Air Lines, Inc.
Delta Air Lines hosted their 12th annual Golf Tournament at Eagles Landing Country Club on Friday, October 12. More than 120 golfers hit the links to raise money and show their support for families and patients treated at Children’s Healthcare of Atlanta. Greg Kennedy, Senior Vice President, Operations, Hubs for Delta Air Lines leads the event with one motto in mind: “It’s all about the kids!” A focus on the kids, gorgeous fall weather and a generous team of vendor partners made the event a great success this year! Larenz Soares is a happy 11-year-old who is motivated to excel and help others. But, he struggles daily to manage a chronic illness that leaves him in unspeakable pain and often hospitalized. At 3 years old, Larenz was diagnosed with sickle beta thalassemia, a rare form of sickle cell disease that causes many health problems. Most patients are diagnosed at birth. However, Larenz had been healthy until he was 3. It was only when he woke up with a yellow tint in his eyes one morning that his mom, Greta, knew there was a problem. Larenz is admitted to the hospital frequently and typically stays for days at a time, often missing school. But, resources such as the Children’s School Program have helped Larenz stay on track. He has maintained academic honors throughout grade school. Greta says Larenz perseveres through his illness and inspires others. 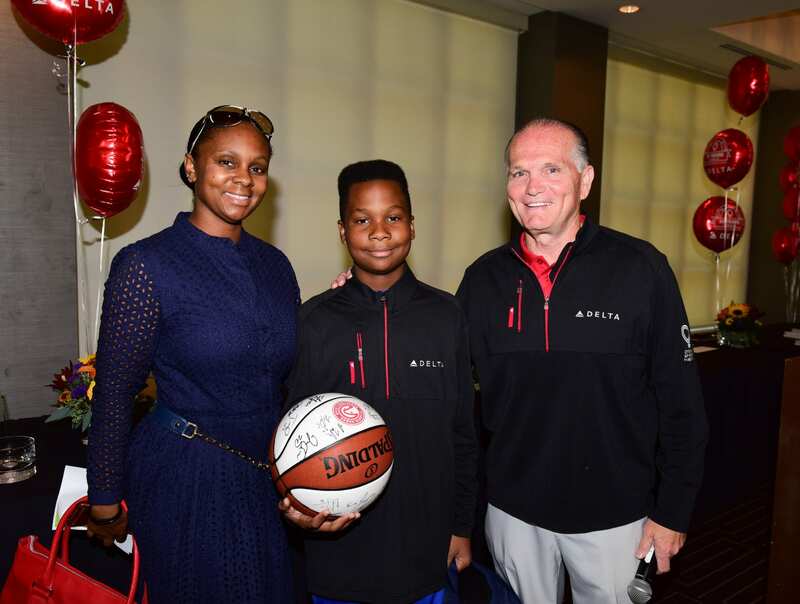 Afterwards, Delta Air Lines presented Larenz with an autographed basketball. A check presentation is being scheduled to announce this year’s official total, which is on track to beat last year’s amount of $320,000!